Without this article seeming overly self-serving, I think it’s a wonderful gesture when you give your landlord a small gift during the holidays. After all, you are living in your landlord’s property, and good landlords often really care about a tenant’s happiness while renting. Excellent landlords will often clean out your hair clogs in the shower drain (for free), even though your lease says you need to hire a plumber. To be honest, most Landlords really don’t want much from you. Simply keep the property clean, pay your rent on time every month, and notify the Landlord of any repair issues. If you can do this, your Landlord will forever put you on his “Nice” list. In my case, I try to go the extra mile for my tenants, and don’t ask for anything special in return. However, if you are feeling generous, and want to nurture the relationship, a small Holiday gift goes a long way. After all, there will come a day when you need your Landlord to write a good reference for you, or forgive a late fee when you forgot to send rent. Remember, you need your Landlord just as much as he needs you. In my opinion, it’s always a good idea to build a nice friendship with your Landlord. So, you ask, “what kind of gift should I get my Landlord?”. Well, it’s simple. This is a fantastic tool for any Landlord or handyman. It is a pocket knife on steroids. It easily stores in a pocket or glove box, and will save your landlord countless trips to and from his home to pick up the “right tool”. In my opinion, Leatherman makes the best multi-tools. My two favorite are the Leatherman Wingman Multi-Tool and the classic Leatherman Wave Multi-Tool. Gift Cards are always good choices – especially if you put a little thought into them. Gift cards to The Home Depot, Lowes, and Amazon.com are incredibly useful. If there is a local Hardware shop that your Landlord prefers (such as TrueValue or ACE Hardware), I’m sure he/she will appreciate that as well. A Tool Bucket Organizer is a must-have for all Landlords. It stores a variety of tools and is easily transported from property to property. I have found that the bucket is a better than the classic tool box because everything is easily accessible. Hire a professional maid service to clean the property that you are renting – especially if you are near the end of your lease and not going to renew. Send your landlord a Holiday card with a copy of the receipt. Your landlord will really appreciate it, I promise! Making homemade chocolate chip cookies is always a nice gesture. But beware, if it is the holiday season, some people will already have too many cookies – from friends, family, other tenants, etc. In this case, most of the baked goods will go stale and will get thrown away before the family can eat them. So it’s a nice idea, but overused by everyone. Rental properties need a fresh coat of paint from time to time. If you volunteer to paint a room or two, you landlord will greatly appreciate it. However, make sure that the colors you choose are approved by your landlord. If you ask nicely, maybe your landlord will even buy the paint for you. If you are on good terms with your landlord, feel free to offer a voucher for 1 free night of babysitting. This will give your landlord an opportunity to have a date night – which also makes the spouse very happy. But don’t offer this up unless you have a good relationship with your landlord and her/she already trusts you. Spend the extra few dollars and buy some really good chocolates. 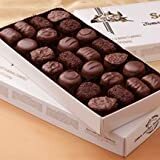 Sees Candies are always good choice. So are Ghirardelli Chocolate Squares. If I received either of these chocolates, my My wife would be very happy, and therefore, those tenants be on my proverbial “favorite” list (i.e. priority treatment, and lots of graces). Buy a vintage cartoon sketch that pokes fun at Landlording. Buy a nice matte and frame and send it to your Landlord. It’s creative and thoughtful. Cartoon Stock has some great landlording cartoons. A cost-effective form of appreciation is to create a 1-2 minute video of you and your roommates/family doing something funny and memorable. JibJab offers some really funny cards that allow you to put your face on dancing cartoons. If I received a video like this from my tenants, I would send it around to my friends and family and they would think I have the best tenants ever. Coolz said. The relation between a tenant and a landlord is very important. Because any bad relation can interfere you day to day life. You can be distracked from your work by that bad relation. This gift idea is really fantastic. Eric, Thanks for your comment. I’m in favor of anything that builds good will towards the other party. Merry Christmas. My landlord has horses so I took a nice photo of them, matted it and I’m giving it to them for Christmas. That’s awesome Diane. I hope they enjoyed it! Very thoughtful!